Hedge fund managers like David Einhorn, Dan Loeb, or Carl Icahn became billionaires through reaping large profits for their investors, which is why piggybacking their stock picks may provide us with significant returns as well. Many hedge funds, like Paul Singer’s Elliott Management, are pretty secretive, but we can still get some insights by analyzing their quarterly 13F filings. One of the most fertile grounds for large abnormal returns is hedge funds’ most popular small-cap picks, which are not so widely followed and often trade at a discount to their intrinsic value. In this article we will check out hedge fund activity in another small-cap stock: Gladstone Commercial Corporation (NASDAQ:GOOD). Is Gladstone Commercial Corporation (NASDAQ:GOOD) a buy here? The best stock pickers are in a bullish mood. The number of bullish hedge fund bets improved by 1 lately. Our calculations also showed that GOOD isn’t among the 30 most popular stocks among hedge funds. Let’s go over the latest hedge fund action regarding Gladstone Commercial Corporation (NASDAQ:GOOD). How are hedge funds trading Gladstone Commercial Corporation (NASDAQ:GOOD)? Heading into the fourth quarter of 2018, a total of 6 of the hedge funds tracked by Insider Monkey were bullish on this stock, a change of 20% from one quarter earlier. 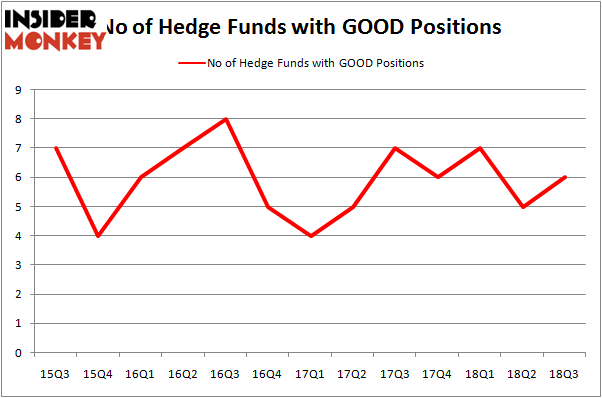 The graph below displays the number of hedge funds with bullish position in GOOD over the last 13 quarters. So, let’s find out which hedge funds were among the top holders of the stock and which hedge funds were making big moves. Of the funds tracked by Insider Monkey, Renaissance Technologies, managed by Jim Simons, holds the number one position in Gladstone Commercial Corporation (NASDAQ:GOOD). Renaissance Technologies has a $47.9 million position in the stock, comprising less than 0.1%% of its 13F portfolio. Coming in second is Millennium Management, led by Israel Englander, holding a $4.1 million position; less than 0.1%% of its 13F portfolio is allocated to the stock. 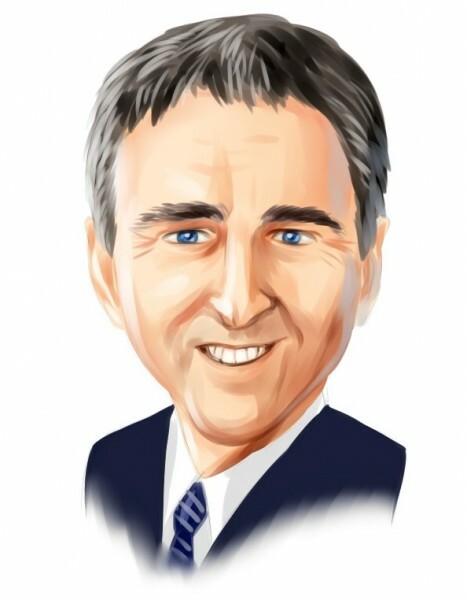 Some other hedge funds and institutional investors that hold long positions comprise John Overdeck and David Siegel’s Two Sigma Advisors, Ken Griffin’s Citadel Investment Group and Matthew Hulsizer’s PEAK6 Capital Management. As aggregate interest increased, key money managers were breaking ground themselves. PEAK6 Capital Management, managed by Matthew Hulsizer, assembled the most valuable position in Gladstone Commercial Corporation (NASDAQ:GOOD). PEAK6 Capital Management had $0 million invested in the company at the end of the quarter. Let’s now take a look at hedge fund activity in other stocks – not necessarily in the same industry as Gladstone Commercial Corporation (NASDAQ:GOOD) but similarly valued. These stocks are TPG Pace Holdings Corp. (NYSE:TPGH), Lands’ End, Inc. (NASDAQ:LE), Limelight Networks, Inc. (NASDAQ:LLNW), and On Deck Capital Inc (NYSE:ONDK). All of these stocks’ market caps resemble GOOD’s market cap. As you can see these stocks had an average of 17.25 hedge funds with bullish positions and the average amount invested in these stocks was $132 million. That figure was $55 million in GOOD’s case. On Deck Capital Inc (NYSE:ONDK) is the most popular stock in this table. On the other hand Lands’ End, Inc. (NASDAQ:LE) is the least popular one with only 14 bullish hedge fund positions. Compared to these stocks Gladstone Commercial Corporation (NASDAQ:GOOD) is even less popular than LE. Considering that hedge funds aren’t fond of this stock in relation to other companies analyzed in this article, it may be a good idea to analyze it in detail and understand why the smart money isn’t behind this stock. This isn’t necessarily bad news. Although it is possible that hedge funds may think the stock is overpriced and view the stock as a short candidate, they may not be very familiar with the bullish thesis. In either case more research is warranted.